@FrolickingFizzgig wrote: Great stuff! I'm curious, would you say anything about the Ben being creeped on excerpts turned out to be "vague" or taken out-of-context, or are the still just ominous references to Leia/Ben being watched by something? "The baby turns inside her again, troubled by something she cannot feel and cannot yet understand." @WhatGirl Yes, there's a quote that Jakku was a verdant planet. However, archaeological digging that Palpatine conducted is really drilling to the core of Jakku in order to make it explode if the Empire fails to protect its Emperor. No other significance. There is still the business of the 'Consecrated Eremite' who was said to dwell on the Plaintive Hand Plateau (that Palpatine had excavated) back when Jakku was a lush green planet. Eremite means hermit and religious recluse. I also find it interesting that Rey is said to have found plants growing in the AT-AT she chose to live in on Jakku. She also finds flowers, like the one we see in TFA. The amount of child abuse in this book is staggering. Baby Ben probed by the dark entity while in his mother's womb. Feral children trained and ordered to kill. Little Armitage Hux encouraged to be their sadistic leader. Anchorite revealed to have forced orphan children to suffer in the name of religion. Very sad. I found the prediction they made about Anakin's birth being a force-driven reaction to Snoke's existence very interesting. Immediately made me think of Kylo's line about finishing what Vader started working as ironic foreshadowing of Kylo possibly defeating Snoke to bring balance back to the force. @vaderito wrote: The amount of child abuse in this book is staggering. Baby Ben probed by the dark entity while in his mother's womb. Feral children trained and ordered to kill. Little Armitage Hux encouraged to be their sadistic leader. Anchorite revealed to have forced orphan children to suffer in the name of religion. Very sad. Snoke is possibly the most despicable SW villain ever. Omg baby Ben snuggling and his tiny little mitts...I just can't. 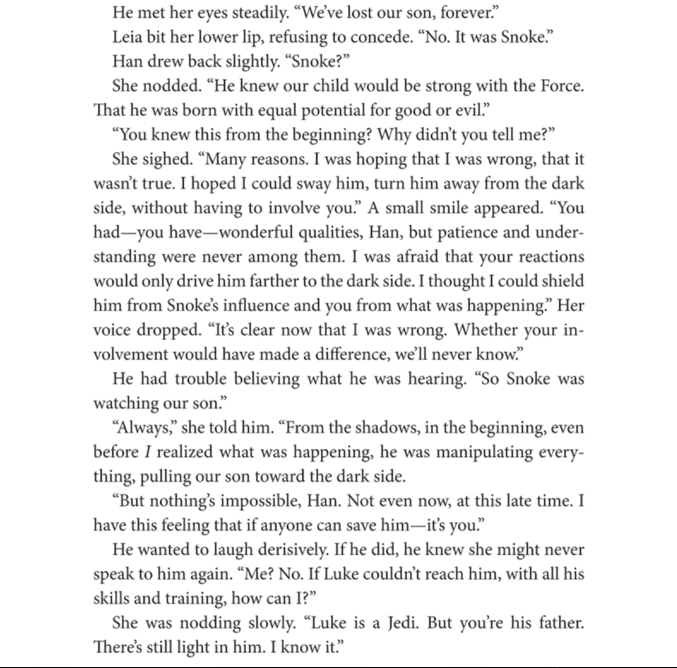 I didn't think it was possible but Han's foreshadowing words make everything even more sad and tragic, just like him and Leia talking about grandchildren in one of the previous books. -Ben was born on Chandrila. -Also more rumors that Leia was in labor FOR THREE DAYS (Jesus, Ben. Not even out and you’re causing some trouble). But then there’s also rumors that it was painless and fast (no one knows because I guess this is TMZ now lol). -Leia keeps her family name Organa (so she’s not Leia Solo) and Ben’s last name is Solo. -Ben has a Tooka doll, which looks like a cat? Han uses it to stop his crying but it doesn’t work. -Han actually believes Leia can calm him down with the Force, and has “seen enough strangeness just to believe it’s just a bunch of hooey”. -Han is hesitant about picking Ben up and has to be coerced by Leia. -Han: “I smuggle, not snuggle”. -Han finally brings Ben close to his chest and he stops crying. Oh I hope that is a sign that Kylo and Leia do in fact have an important relationship. It has been said that since Kylo never talked about or visibly thought about Leia in TFA, she won't be as important to him/his story, and I really hope that isn't true. Also this is all way too cute oh my gosh. There are still two other movies and honestly I've always thought that the only reason why Kylo's relationship with Leia specifically is never mentioned in the first one is just because it will be addressed later, in a "save the best for later" way. Especially since it's from Leia's side of the family that he got his Force powers and that's what caused him to be Snoke's target, and since she's now the only parent he has left. I seriously doubt that they won't interact with each other again, and I think that moment will be very emotional (but sadly with what happened to Carrie, who knows what they'll do now). With Leia being Force-sensitive their relationship was probably different compared to the one he had with Han...they could sense each other from the beginning, and in tfa she’s the one who says that she wants her son back and that there's still light in him. They both have to forgive each other for the things that happened in the past, even if in a different way and in a different measure, so I do believe that there will be a sort of closure to their story. Yeah I think that too. The more I read stuff about Leia and Ben's relationship in the books, the more I'm convinced that Leia was to have a big role in IX that was instrumental in Ben's story and helping him come back to the light after Rey helps him want to seek redemption. I also believe that in contrast to Leia, Luke believes that Ben is too far gone "down the dark path" to be brought back and has to see how Ben is changed in order to be able to forgive him. I think there would have been a focus on their relationship too, with them disagreeing on whether Ben still has good in him as well as Luke disappearing among other things putting a strain on their relationship. Sadly with Carrie Fisher's tragic death, I don't think we're gonna get this. WhatGirl wrote: I don't remember where, but I read that Jakku used to be a "lush, green world" thousands of years ago. Palpatine was looking for an object "that was significant thousands of years ago and will be again" buried on Jakku and at one point he oversaw the Imperials doing archaeological digs. I think if Snoke was banished to the core of the planet by the first Jedi then his dark presence was like a slow corruption that made everything wither away over time. Maybe the object was found and then used to contact and/or free him. But this theory is still in the works and I need to read these books. I believe this too! I believe that Jakku was beautiful and teeming with life and very strong in the Force, but an ancient battle (perhaps one that sealed Snoke away) destroyed all that, turning Jakku into a desert wasteland and severely damaging its connection to the Force. That's why it took Rey so long to have her awakening and why Snoke and Kylo Ren didn't sense it until she left Jakku. Green Jakku is one of the spoilers from Empire's End. I had to wait another 10 days to get the book. Damn shipping from UK! Thank you for that! Oh this is exciting! I've believed for a little while that Jakku wasn't originally a desert wasteland and something ancient happened to make it the way it was. I'm certain other people thought the same if I remember correctly, yes? But this seems to go in that direction. I'm getting huge KOTOR vibes from this (yes, KOTOR again ). I remember during the game the Jawas hinting to Revan that Tatooine was a lush and green world once, but that it was turned into a desert planet over time. It's implied it's due to the Star Map present there, since its Dark Side power unbalances the planet's ecosystem. It does the same with the other planets where the other fragments of the Star Map are present (Kashyyyk with the giant trees, Manaan, a sea world, and Korriban, a rocky desert world which is also the home for the tombs of many Sith lords). So if Jakku was once a lush planet, maybe it became a desert planet because of a Dark Side relic like the Stap Map? Or perhaps a Dark presence like Snoke? Man, the theory that Rey's parents are the ones who freed Snoke fits so perfectly it isn't funny anymore. Would also fit with the Raiders references because it's Marian's father who discovers the key to the Staff of Ra and she ends up pursued by the bad guys. He ran. For one klick, then another, until his legs ached so hard they felt like clumps of cured, dried meat hanging from his hips. But now here he is, atop the Plaintive Hand plateau--an outcropping of bent, flat rock that the anchorites say is a holy place, a place the Consecrated Eremite considered home thousands of years before, when Jakku was supposedly a verdant, living place. Kylo performed the blaster freeze so Jakku definitely didn't suppress his powers. Just pointing that out for anyone who thinks that Jakku may have suppressed Rey's. It would be a bit of a plot hole. Please give that man a hug. For all our sakes. @vaderito wrote: Kylo performed the blaster freeze so Jakku definitely didn't suppress his powers. Just pointing that out for anyone who thinks that Jakku may have suppressed Rey's. It would be a bit of a plot hole. Well...given some of the other inconsistencies in TFA, a plot hole like that wouldn't be out of the question. I guess you could always interpret it as Jakku suppressing Rey's force powers to a certain extent (since she wasn't even aware of them). Jakku-suppressing-Rey's force powers in some way would align with the interpretation that Rey "awoke" when she got the Falcon into the air and got off of Jakku. The evidence for this is that the "there has been an awakening..." scene followed shortly after that. If you go with the theory that Rey's force abilities become stronger around Kylo, there's also the possibility that HE initiated the awakening himself when he landed on Jakku in the village attack. Ben just wants love and cuddles. That's the thing. We don't know what caused the awakening - the map, leaving Jakku ground, Kylo's proximity, something else. One thing is certain, the Force wanted them to meet. Maz tells Rey that the light inside her has always been there guiding her. I don't think Jakku suppressed the force ability inside of her but it may have shielded her somehow from outside (Snoke's) notice. It took her leaving Jakku for Snoke and Kylo to feel 'The Awakening' and it took Rey coming into direct contact with Kylo for her abilities to expand. She was using the force in a reduced capacity before that, though. That's how I've pretty much read things. I'm not married to that interpretation, but I think that series of events best aligns with what we saw onscreen in TFA. but Kylo was also the Awakening so what influenced his? @vaderito wrote: but Kylo was also the Awakening so what influenced his? Being near Rey? If there's a dual awakening (per JJ), and if they have a special Force connection, then it would make sense that they would trigger the awakenings in each other. JJ said Rey and Kylo were two disparate pieces coming together so perhaps neither could achieve their potential until they met. Their finding the force moment on the cliffedge sounds like a mutual thing, although we only saw the immediate effects in Rey. We have yet to see in TLJ what Kylo got out of it. We assume he's coming back darker, even after killing Han weakened him, but we shall see. Lead up to TLJ is sending such mixed messages. On one side, they emphasize the connection (JJ, databank) on the other side, marketing is going overboard with Rey, Finn and Poe as Harry,Ron and Hermione. Like, first that toy box and now celebration poster. But I think part of Kylo's awakening happened when he spared Finn on Jakku. Would being on the same planet be sufficient proximity? Maybe. But I also think that the force may have played a huge role in Finn defying his orders on Jakku ... not to indicate that Finn is FS, but more to get the ball rolling between the three pivotal characters who are all products of the postwar galaxy and the profound child abuse and neglect involved. After finishing Empire's End, I think the Awakening may be the way the Force strikes back against Snoke and everything that has surrounded him. So maybe you are right on proximity. The three were all together for the first time on the same planet ... and the Force wanted it that way. Further, I agree with you @vaderito, the level of child abuse is staggering. We always thought that the movie would tiptoe around child abuse, but I don’t see how it can avoid it completely. The whole Empire needs children/the young (which would bring the Acolytes of the Beyond in as well) and the level torture/abuse/force mind-addling that happens is all over the book. Kylo/Rey/Finn all had something terrible happen to them. Abuse and neglect is like encoded in the DNA of the ST. I think that they are going to have to show something for Kylo. That Fantastic Beasts movie explicitly showed abuse with "could play Kylo as a teenager" Ezra Miller's character. It also showed how profoundly it damaged him. I wouldn't worry about it. It's just marketing. Rey and Finn are the dynamic duo of TFA while Poe is handsome and heroic. This sells. Besides, Kylo and Rey's relationship will evolve in Episode VIII, TFA was just their first meeting. They shared a mysterious connection and all, but their relationship is still on Level 1 and the whole thing was very subtle -- the general audience doesn't care about books, databanks or JJ's commentary. It makes no sense to put them together on boxes/posters now. They did that for TFA too and Poe was barely a character. More a plot device. And again, Finn and Poe are looking a different way than Rey. And Rey and Kylo are looking the same way, their lightsabers seemingly facing the same opponent with Luke as kind of a bridge and Kylo being between two of his fathers, Han and Luke. There three pairs on that poster at the same level: Anakin and Padme, Han and Leia and well, Kylo and Rey.